Four individuals are under arrest in connection with the deaths of a cow and three calves in St. Landry Parish. Following a tip, the Louisiana Department of Agriculture and Forestry (LDAF) Brand Commission and St. Landry Parish Sheriff’s Department arrested 20-year-old Jameson LaGrange of Leonville, 21-year-old Jacob Hebert of Port Barre, 21-year-old Kaitlin Gauthier of Port Barre, and 18-year-old Christian Meche of Port Barre. All are charged with four counts of simple criminal damage to property valued at $6,500 and four counts of aggravated cruelty to animals. “This is a complete disregard for someone’s property, livelihood and the lives of these animals,” said LDAF Commissioner Mike Strain, D.V.M. 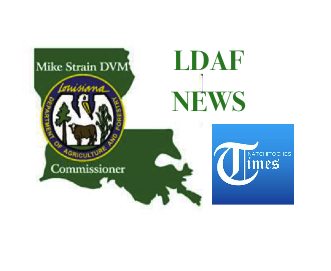 On March 3, 2018, LDAF Brand Commission Inspectors received a complaint from a rancher in reference to cattle killed on the levee near Port Barre. A cow and three calves were found dead in the pasture portion of the levee. It appeared they had been run over by a truck. Witnesses told investigators they heard what sounded like trucks mud riding in the area around midnight on March 3. “Once we put the word out that we were looking for those responsible for this crime, members of the public came forward with information to help solve this case. We greatly appreciate their willingness to do so,” said Strain. Bond is set at $35,000 for each suspect. The Port Barre and Leonville Police Departments assisted in the investigation.